I love baseball. I also love baseball movies -- the greatest of all time being, of course, Field of Dreams. 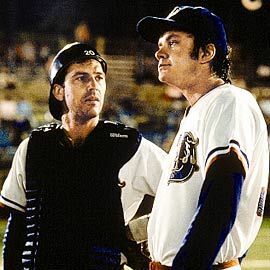 But one of my other favorites is the comedy Bull Durham. In he film, there is a young pitcher, "Nuke" LaLoosh (Tim Robbins), who is talented but...unfocused. (Okay -- he's an idiot.) Kevin Costner's "Crash" Davis and Susan Sarandon's Annie Savoy have the task of grooming Nuke for the majors. Crash takes the baseball experience approach, but Annie goes a more philosophical route. When Nuke loses his control on the mound, Annie has him wear women's underwear ("Rose goes in the front, big guy.") and she tells him to breathe through his eyelids. In essence, what she gets him to do is to stop thinking about pitching and just "let it happen." This works for Nuke. Kurt, the bassist in my band, used to look back at me when he made a mistake on stage and he would point to his head, implying that mistake came when he started thinking. This is debatable philosophy, of course, both in Nuke's case and in Kurt's. My classical guitar teacher completely disagrees. Thinking, she says, is everything. "Never trust your hands to do the right thing," she says. Of course, individual results may vary. We all know what it feels like to find our groove in our own particular milieus. It feels good when things "work" without effort. It's weird, though. I find I have a real distaste for debunking approaches when it comes to creating stories or music. With drumming or with guitar-playing, I'm fine with thinking and analyzing and repetitive exercise. But, while I seldom...uh, never wear women's underwear while I compose music or stories, I do prefer for those processes to remain a mystery. Not surprisingly, the only book on writing I have ever willingly read. When I teach writing, I often feel a little guilty -- as if I am flimflamming my students. I teach them processes I never use; though, in my defense, I do admit this to them, stressing that I am giving them a starting-point from which they can devise their own methods. But I have to tell you, it makes my skin crawl a little to talk of outlining and clustering and the rest. Maybe I feel this way because there seems to be so little laymen-accessible mystery anymore -- as opposed to the numerous puzzles experts are trying to work out about, say, warp-drive technology. Creativity is my own little internal mystery. And when I look back at the products of my own brief sleepwalks, maybe I am bolstered by the idea that there might be more to me (and to all of us) than this frail mortal coil reveals. It will be a sad day when everything is documented and explicated. Ah, that will never happen. Who am I kidding?